298 loyalty points Your cart will total 298 points that can be converted into a voucher of 11,92 PLN. This fantastic pre-workout product will also accelerate recovery after intense training. CellZoom includes well-known, proven research components that maximize training intensity, strength and concentration during exercise. All these elements significantly affect muscle growth and regeneration. 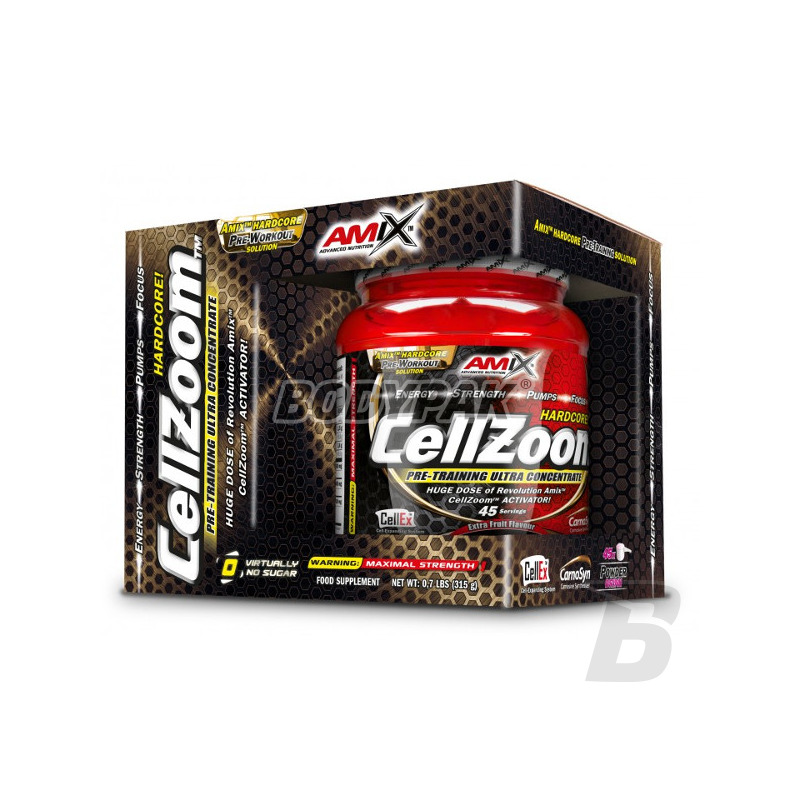 Just one scoop CellZoom divides you from the best workout ever! Stir 1 scoop (7 g) in a glas with 200-300 ml of water and take the drink approx. 30-45 minutes before physical performance. To change the flavour and sweetness of prepared drink change the amount of water used for preparation. Maximal daily dose is 1 scoop (7 g)! Do not exceed the maximal daily dose! Acidity regulator: sodium carbonate, l-arginine HCl 1000mg, creatine monohydrate 1000mg, creatine ethyl ester 500mg, 500mg tricreatin malate, acidity regulator: citric acid. Ingredients (7g): alpha-ketoglutran arginine 1600mg, beta alanine (CarnoSyn) 1500mg Camellia Sinensis (green tea extract) 50mg, aroma, sweeteners (Splenda sucralose, acesulfame K), colorants (beetroot color, beetroot color, orange: red beetroot), caffeine 200mg anhydrous, 150mg DMAE (2- / Dimethylamino) Huperzia Serrata - extract (5: 1) 10mg, Loguat Powder - extract (eriobotrya japonica) powder 10mg, muira puama - extract 10mg, rhadiola Rosea - extract 10mg, Schizandra Chinensis - fruit extract 10mg. Bardzo dobra pompa mięśniowa, pobudzenie wręcz ekstremalne! Rewelacja !!! Niesamowita pompa na treningu i motywacja zdecydowanie w górę! Kupie kolejna puszkę.